The Performance Pathway is an easy to follow progression which starts with a high-level assessment of your business, through to more detailed assessments in key areas of compliance and management. Each assessment is conducted onsite and provides you a detailed report of the findings. The findings include an overall risk rating: low, medium or high. The report identifies areas that need attention so you can direct resources as needed. Ultimately you can even choose certification in a recognised management standard so you can show you are best practice. The Performance Pathway takes the angst and uncertainty out of checking for compliance and seeking certification. Each assessment will identify areas of weakness or low compliance. You should take steps to address these either using your own resources, or with support from the specialists available to you such as APSCo Australia and Network Partners. The Pathway can be completed in 12 months depending on your level of assessed risk and commitment to improvement. 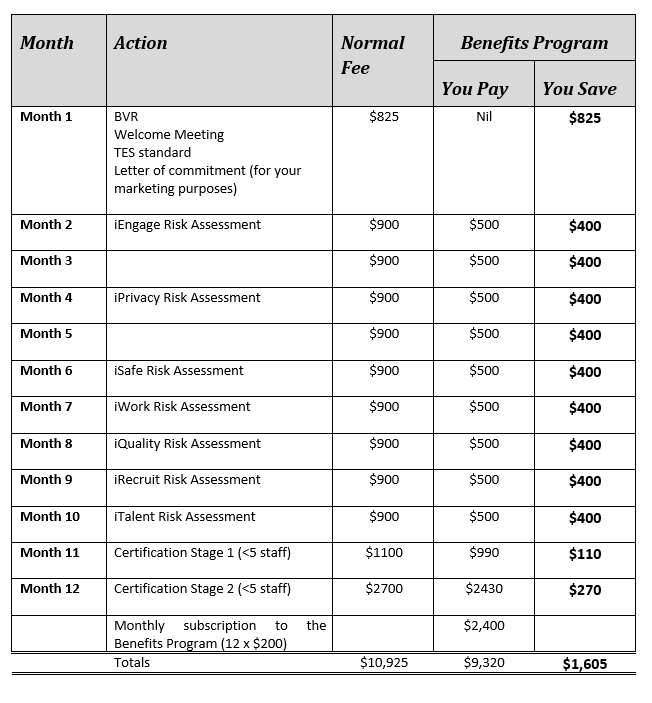 A fee is payable for each assessment, and discounts applicable to members of the Benefits Program.